Choose a central server. The runner may initiate a run on that server during which he or she cannot jack out. Otherwise, add An Offer You Can't Refuse to your score area as an agenda worth 1 agenda point. If there's one thing Jinteki is good at, it's making the runner make terrible decisions that lose them the game. The classic, of course, is Mushin No Shin--do I run this (risking a Junebug flatline) or do I not (risking a TFP score or a Ronin flatline)? A poor decision, especially late game, could be the deciding factor. An Offer You Can't Refuse puts this same sort of decision on the runner. If you don't run, the corp gets an agenda point for the low, low cost of 4 and the used to play the card. One point doesn't seem like much--but at the right time, it can mean everything. A Jinteki deck at 3 points isn't so scary; if they Mushin a card, the runner doesn't typically have to check it, because even if it is a 5/3 agenda they can't score out. If the corp is at 4 points, though, that could be the winning agenda, and the runner has to respect that. But the real threat comes at 5 points; suddenly, every unadvanced remote starts to look like a Braintrust or a Philotic Entanglement, and the runner has to start checking them, making it easy to hit them with a non-advanced trap like Psychic Field. So obviously, the runner doesn't want to let the corp get that point. But the alternative is also pretty bad. The corp gets to choose the server, meaning they will choose the nastiest, the deadliest, or at the very least, the most expensive central server. Maybe they make you run through a Chum in front of a Crick, hitting an Archives with three Shock! and a Shi.Kyū. Maybe they use this as an opportunity to use Batty on Grim, killing your sentry breaker with the Batty'd subroutine so that you lose another breaker. Or, maybe they just make you run HQ, and pull off the Chum+Kitsune+Snare! for six net damage in one hit. Which option will they choose? Well, that depends on a number of other factors. In the early game, the runner might not have their full icebreaker suite up, and letting the corp go from 2 points to 3 isn't so terrible--most runners will let you have the point to avoid a rig wipe. Later on, though, a fully rigged-up runner doesn't have as much to fear...provided they have the money to run, and if you make the Offer when they're low on funds they might hesitate. Of course, if you can get to 6 points, then the title of the card becomes literal--they cannot refuse without losing the game. You'll notice I've only mentioned in-faction cards. That's for a good reason--at three influence, it's hard to justify including AOYCR in another faction, and most of the best kill-server cards are of Jinteki design. An exception might be made for certain bioroid ICE--because the run is happening on the corp's turn, they have no clicks to spend, making Ichi a scary proposition. However, most bioroids feature "End The Run" subroutines, and if the runner can escape your Offer by bouncing off an Eli you've wasted your time. So, in conclusion, An Offer You Can't Refuse is a solid addition to the murderous Jinteki arsenal, but doesn't play well out of faction. It goes a long way towards solving the Jinteki problems of not being able to actually score, and not being able to lock down the kill. As tiedyedvortex has already locked down the powerful standard usages of this card, I will instead be looking at the unique interactions this card enables. No promises that said interactions are actually good or useful. Bullfrog can bounce the Runner onto a remote server of your choice unexpectedly. I don't need to tell you how dangerous this is against a Jinteki deck. Plain and simple, if Bullfrog fires during an Offer run the Runner is playing a psi game to avoid losing to your triple-advanced Project Junebug. Of course, getting Bullfrog to fire is not easy, but it's the only way I know of to move the run to a remote server instead. Space Camp is a cheap import, fires from Archives, and adds advancement tokens. Forcing a Runner into three of them is like fast advance! Even just two will let you score 3/2s. Award Bait has the same effect if you're willing to splash this into NBN. This is the only way to fire those cards on the corp's turn, letting you exploit the advancement counters before the Runner can even consider running whatever they're sitting on. Tagging ICE and traps. Sadly, Data Raven doesn't work because they can end the run as part of the "when encountered" ability, which is not the same thing as jacking out. However, if your ICE can tag the Runner or they hit a Snare! then you have two more clicks to exploit the tag before they have a chance to clear it normally. Snare in particular is incredibly dangerous if you've got Scorched Earth sitting around, and is about the only thing for which this is better than just using SEA Source. Janus 1.0. Nuff said. No clicking through on the corp's turn. Of course, this thing is horrifically expensive to rez and should probably be pre-rezzed using some trick or other, in which case no sane Runner will actually faceplant into it. So it's useful for forcing the Agenda point, at least. If you can actually get the 19 creds to both play this and rez Janus set up without falling so far behind that Janus is breakable the old-fashioned way, then more power to you. Go find yourself a couple Neural EMPs and finish them off. Lockdown locks out card draw on the Corp's turn. This prevents a number of flatline defenses such as I've Had Worse from triggering while you kill them with whatever else you have on hand. Shiro combined with an Offer on R&D has the potential to be extremely deadly. If you put a Snare! up there then they'll be forced to access it TWICE: Once when Shiro's second subroutine fires, and once when the actual R&D access happens. Credit-intensive (4 for Offer, 6 to rez Shiro, 8 to fire both Snares), but 6 net damage is 6 net damage. 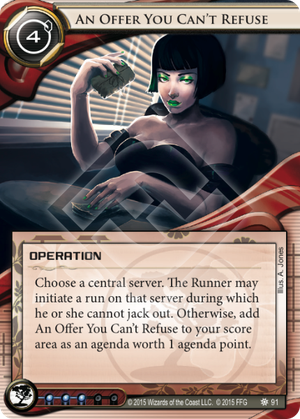 Naturally any use of this card has to be able to use the Agenda point or there's no reason for the Runner to accept. But that doesn't necessarily mean you have to realistically threaten to score out! Enforcer 1.0 and Archer are powerful Sentries that are well worth spending an additional four credits to rez in lieu of an actual Agenda, and will make accepting future Offers much more dangerous, especially Enforcer which doesn't even end the run and can't be clicked through during the Offer.